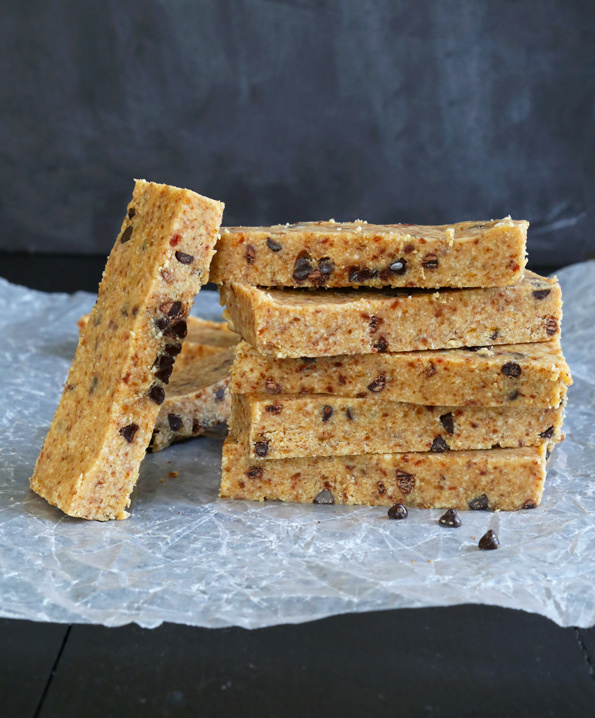 Peanut Butter Chocolate Chip LARABAR Copycats | Great gluten free recipes for every occasion. 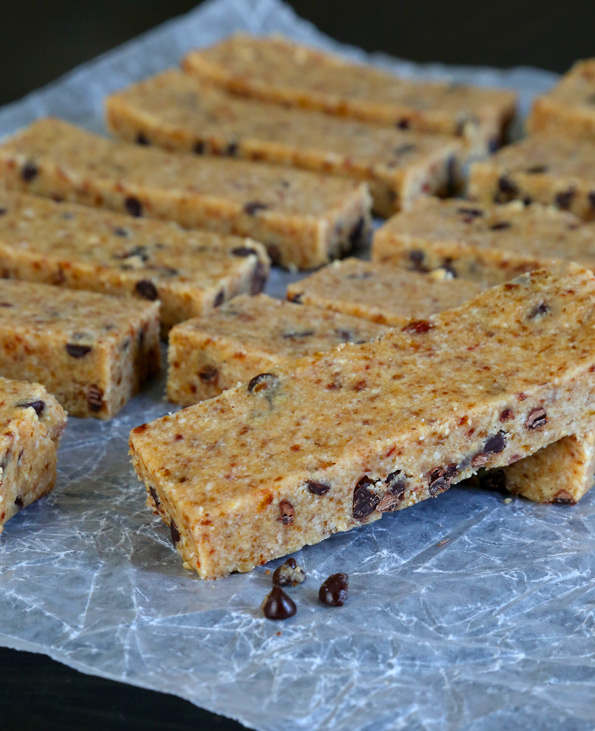 These peanut butter chocolate chip LARABAR copycat bars are the perfect D.I.Y. Friday entry: LARABARS are naturally gluten free, so even though they’re a copycat recipe, they don’t belong in, say, Gluten Free Classic Snacks, and most of us have no doubt bought them in a pinch. 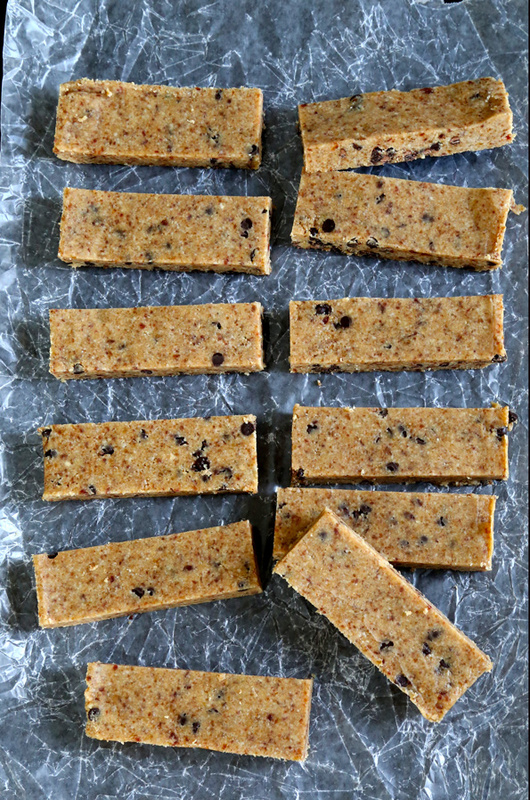 They’re simple, but seriously delicious and even though the peanut butter chocolate chip variety is one of my favorite LARABARs, I actually like this D.I.Y. version even better. I am resisting the urge to apologize to you for sneaking in a D.I.Y. Friday-type recipe on, well, a Wednesday. It’s just that a reader requested this version in the comments, and I haven’t been able to stop thinking about it since. And I already have a very exciting D.I.Y. planned for this Friday and I can’t hold out. Is that something of an apology? Must.stop.apologizing.for.nothing. I made these with Enjoy Life miniature chocolate chips to keep the whole dairy-free thing going, and well really because that is just my hands-down favorite brand of chocolate chips. They have just the right amount of sweetness and manage to hold their shape without being waxy. They can be kind of expensive but they seem to go on sale quite a lot, and when they do I stock up. The LARABARs themselves don’t have coconut oil as an ingredient, but I find that it really helps hold the bars together particularly well. The mixture is ready to be pressed into the pan when it holds together when squeezed, but it will seem like moist crumbles. If you process it until it looks like it’s already holding together without being squeezed, you probably have processed the nuts into nut butter. You’ll know when you get there. No worries. I can honestly say that not only do I give these to my children, along with some fresh fruit, for breakfast, but I have been eating one for breakfast myself and I’m not hungry for hours afterward. For someone like me who develops recipes all day long, not having an appetite for hours is not necessarily an asset, but it’s definitely good for my health. Plus, it makes me feel great about giving them to my kids before they head off to school. Oh, and if you need to make these peanut-free, try replacing the peanuts with raw cashews 1:1 by weight. They’re more mild in taste, but still delicious! In a food processor fitted with the steel blade, process the peanuts on high speed until small crumbs form (about 20 seconds). Add the dates, melted coconut oil and salt, and pulse about 4 times or until the mixture forms wet clumps and holds together well when pressed together with your hands. 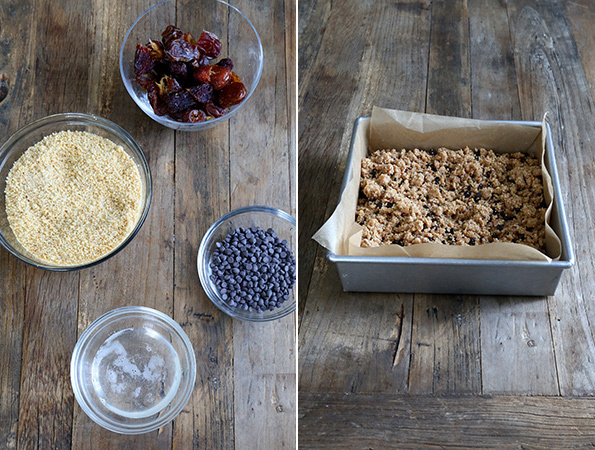 Transfer the mixture to the prepared baking pan, add the chocolate chips and toss to evenly distribute the chips throughout. Press the mixture firmly into one even, compressed layer. Place the baking pan in the refrigerator to chill for at least 30 minutes or until firm. P.S. Don’t forget! Gluten Free Classic Snacks, my next cookbook, is available for preorder! We’ll talk all about it soon, and I’ll announce giveaways and all kinds of fun stuff. Promise! Could sunflower seeds be substitutes? Nut allergy. I have 5 pounds of salted peanuts on hand. Will that work, or will it be too salty? I have cashew meal. Could I substitute that for the whole nuts by weight? I mentioned that in the recipe, Rebecca. That should work just fine. YUM!!! You take such good care of us! I’ll keep my eyes open for them too. Are these found in the granola isle or by the tills? Awesome! Thanks, Nicole. You’re a goddess..
Just wondering what I can substitute for the coconut because my daughter is allergic to coconut? Hi, Michele, try butter (personal preference!) or vegetable shortening (I use Spectrum nonhydrogenated vegetable shortening) 1:1 by weight.